Chronicling the war as it happened, History of World War II focuses on key battles and events that act as signposts in the slow change of fortunes of either side. Divided into two sections, one on each major theatre, the book describes such famous events as the attack on Pearl Harbor, the Normandy landings, the fall of Berlin, and the struggle for Iwo Jima. Linking each famous event is an in-depth chronology detailing key events happening elsewhere, building into a snapshot of the war at that point. 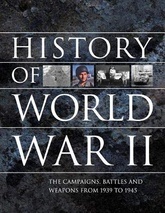 Highly illustrated with full-color maps, color artworks and both color and black-and- white action photos, History of World War II is a handy reference volume on the progress of the conflict and the weapons used to fight it.